Posted by Maddog in Uncategorized. After the landslide pro-life victory in ABS-CBN’s Harapan online/SMS polls, a few more similar public surveys have been put up. The same pro-life trend seems to be evident on these too. 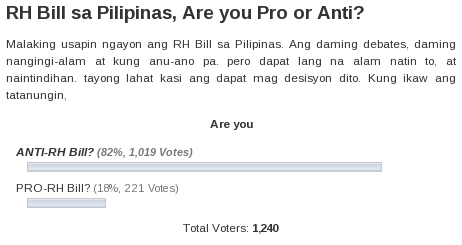 The Philippine Star (a publication partly owned by the Belmontes, related to the very pro-RH House Speaker Belmonte) has been running an online poll at: http://www.philstar.com/Article.aspx?articleId=687349&publicationSubCategoryId=522. The fight is still close, but a clear trend has emerged: most participants in the survey — a lead by 14 percentage points — reject the RH bill. Looks like it’s another pro-life victory here too. Four out of five participants are against the RH bill. 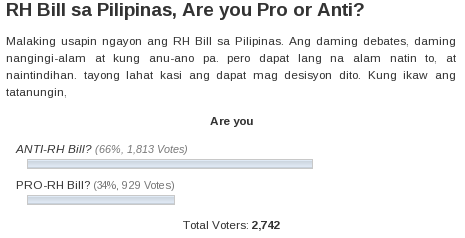 So, where’s the much-ballyhooed pro-RH majority now? Can’t they even get enough people to dominate these polls? 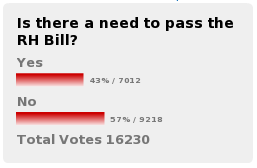 One would think that at least on the well-publicized survey by Philippine Star, the supporters of the RH bill would at least get a small lead (if they actually were a majority), but they can’t even manage that! Granted, these polls aren’t very scientific, but they do give an indication of the public mood in those niche audiences. 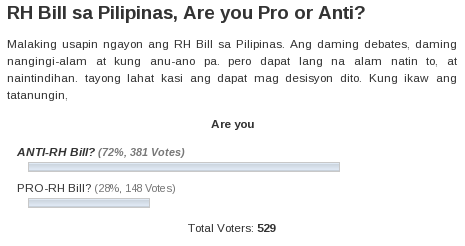 It would seem that any claim of a pro-RH “majority” is not as well-founded or across the board as some propagandists suggest. For those interested in following these polls, here is an update. Looks like a very clear and consistent pro-life trend here. Let’s hope our politicians listen to the people.